The question caught Lydia Naughton, a three-sport athlete at Dulaney High School in Baltimore, slightly off guard. A star forward on the women’s basketball team, Naughton was also a stalwart lacrosse and field hockey player who started in more than 12 seasons during her time as a high school student. She chuckled at the question before answering. “I wouldn’t really say I’m different for each sport,” said Naughton, 18, who graduated on Tuesday. That isn’t to say Naughton lacks drive. Standing at 6 feet tall, she delights in taking charges in basketball, jabbing the ball away in field hockey with her long arms and knocking down passes in lacrosse. 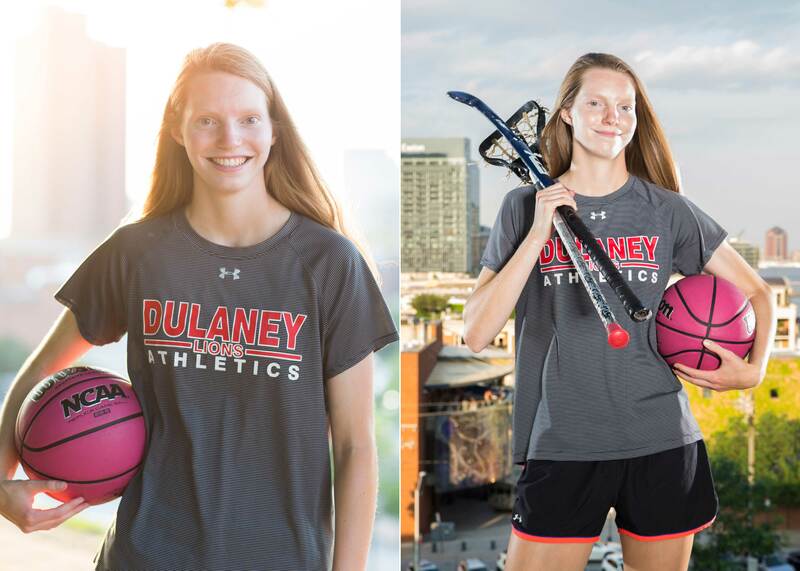 Lydia Naughton is a three-sport athlete at Dulaney High School. She is the team captain of her basketball team and plays forward as a senior in high school. A student-athlete to the core, Naughton maintained a 4.0 GPA in her senior year while taking six Advanced Placement classes (AP economics, AP calculus and AP Spanish among them). She received the Maryland Public Secondary Schools Athletic Association Minds in Motion Academic Award for all 12 of her seasons. As a member of the National Honor Society, National Spanish Honor Society, National Social Studies Honor Society and National English Honor Society, Naughton was a recipient of a $7,500 scholarship at the 78th annual McCormick Unsung Heroes Awards Banquet for which former NBA point guard Tyrone “Muggsy” Bogues was the keynote speaker on May 7. Naughton is also a natural facilitator and leader off the field, a trait she demonstrates as a student leader with the One Love Foundation. Formed in 2010 after the tragic death of Yeardley Love, a University of Virginia women’s lacrosse player who was murdered by her ex-boyfriend George Wesley Huguely V, a UVa men’s lacrosse player, the foundation raises awareness, through education and technology, about domestic violence, especially relationship violence. Naughton understands that she has a responsibility to do more — and she’s good with that. Like Houston Texans defensive end J.J. Watt stepping up to pay for the funerals of the 10 people killed in the shooting at Santa Fe High School, and LeBron James, who is usually off social media during the postseason, turning over his Instagram account to people who are doing something to change their communities and the world, Naughton has bought into that sense of responsibility. And, for her willingness to answer that call, Naughton is this week’s Undefeated Athlete of the Week. Spoken like the facilitator that she is.